We’re attempting to grow onions from seed this year. I say “we” but my daughters have ignored all my requests for help, so I’m on my own at the moment. It’s slowly dawning on me that trying to get children excited at the prospect of growing onions from seed may just be a challenge too far. On my lonely voyage of onion-growing discovery I’ve learned that onion seed (like parsnip seed) needs to be fresh for good germination rates. My first attempt using an out of date packet of seed from the back of the cupboard wasn’t very impressive. 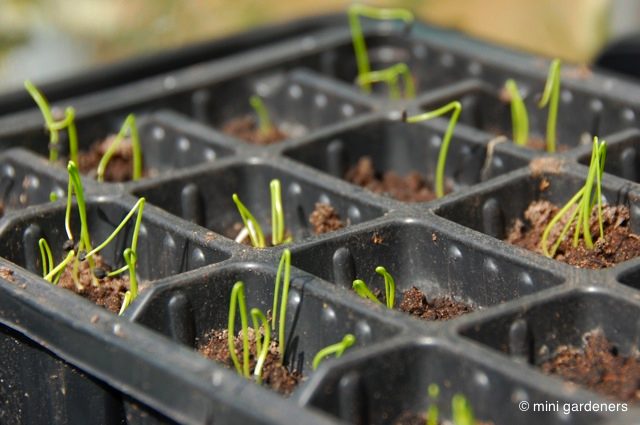 Following the hasty purchase of a fresh packet of seed, I’m happy to report the seedlings are now romping away.